Fibrotic tissue, fresh scars, but also older and bonded scars can be treated well with a Medical Taping therapy CureTape®. The kinesiology tape will accelerate the scar the tape are less deep and also ensures smoother skin. The treatment does briefly turn sustained, but the results are stunning. After one period of treatment, the improvement seen all good, makes the continuation of the treatment easier. Scar treatment is dealt with in the course Lymph Taping for Edema and Skin Therapists. A scar is a persistent deviation of the skin which is arise after healing of a wound. In superficial damage to the skin, there will occur no scars, but also when the dermis is damaged, there will be a visible scar. The surgeon left a neat bonding in which no voltage than the skin can heal nicely. By stress or too much movement skin may get enough rest so that the scar will be visible. Below the skin surface scar tissue may occur in the connective tissue, also known as fibrosis of the tissue. Since the tape is not sterile may only be a fresh scar taped if the wound is closed and covered with skin. 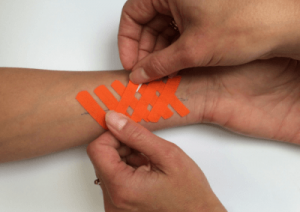 In order to promote wound healing, at this stage it is possible to apply strips of tape next to the wound. The wound will therefore visibly faster close. Did you know that scars are often a cause of imbalance in the body? Scars can often be a cause of imbalance in the body, also scars can also cause other physical problems. MTC teacher Paul van Vliet Tapet since 1998 and is very experienced. When he investigates a client he always looks for any existing scars on the body. For example, a scar from an appendectomy or cesarean may cause undetected symptoms or cause example, do not run smoothly a particular movement. Does your client in moving a limit? 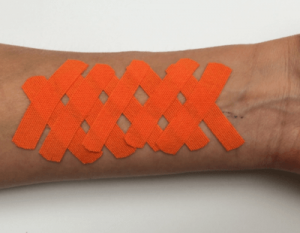 Apply a small strip CureTape® to the scar (preferably orange CureTape). Then ask your client to execute the movement again. Probably experienced immediate difference. Worth a try! Scar treatment by a Medical Taping therapy CureTape®? Request a Skin or Physiotherapist with edema specialist for advice! Note: Please note that the specified tape applications and information on our website about the opportunities in the Medical Taping Concept, have not yet been scientifically proven. The statements and examples cited are based on long term experiences of patients and skilled therapists.